This is the most requested Certificate for BVI companies. 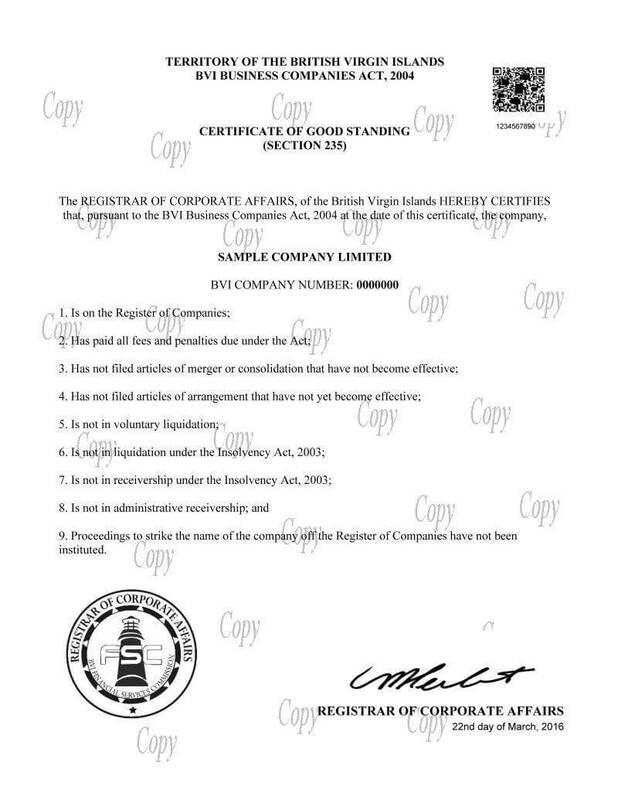 It confirms that a BVI company has met all its statutory requirements at the date of the certificate and it's in good standing within the BVI Registry of Corporate Affairs. This certificate can be requested also for BVI Limited Partnerships. In addition the certificate shows that the company is not under proceedings to be struck off and it has not filed for merger, consolidation or voluntary liquidation. 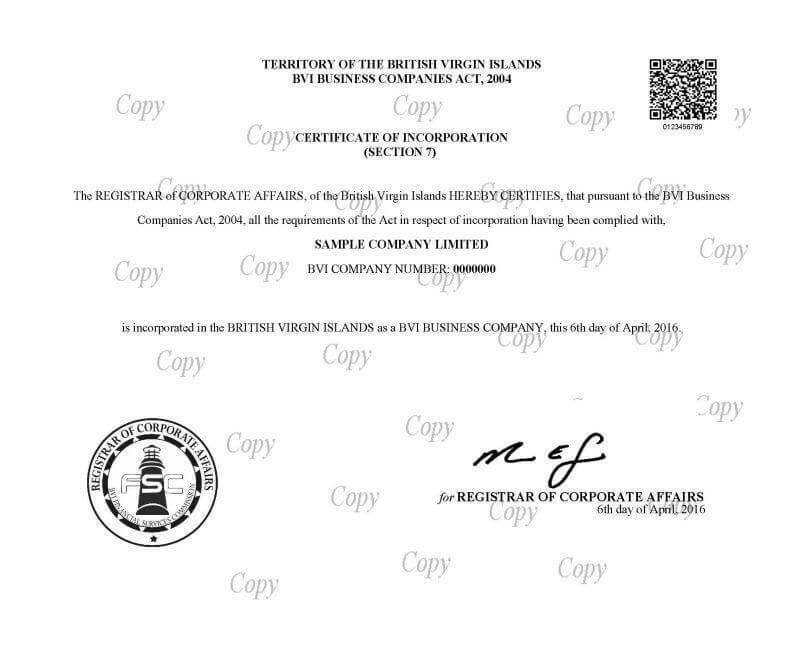 At the top of the document the jurisdiction appears (Territory of the British Virgin Islands) along with the current legislation (BVI Business Companies Act, 2004). Older certificates may show the previous legislation (International Business Companies Act, 1984). At the top-right of the document a QR Code may appear, both in graphic and hexadecimal format. This is also called Certificate ID and it can be used to validate the certificate at the BVI Financial Services Commission website and download an electronic copy of the certificate. This security feature was introduced on 1 July 2014. Electronic Certificates of Good Standing were introduced on 8 December 2014 as a way to improve speed of delivery to third parties. This also enables third parties to verify the certificate is valid. QR Codes appear both in paper and electronic versions of the certificates. If the code is scanned with a mobile phone it redirects to the validation page at the BVI FSC website. Code may also entered manually at the same website to check the certificate validity. (b) the company has paid all fees, annual fees and penalties due and payable. (2) The certificate of good standing issued under subsection (1) shall contain such statements as are specified in the Regulations. Proceedings to strike the name of the company off the Register of Companies have not been instituted. Finally the BVI Financial Services Commission seal appears at the bottom-left of the document. Registrar signature and certificate date are at the bottom-right. The Certificate Date is a very important field because any of the certified items in the list may change from one day to another. BVI Certificates of Good Standing are usually requested by banks and other financial institutions in a regular basis or at the time of an account opening. Other entities that may request these certificates are the parties in a real estate transaction, company clients, suppliers and other related companies in a merger process. If the company is less than one year old there is no need for a certificate as it's assumed the company is in good standing. This certificate can't be issued if the company has due fees at the Registry of Corporate Affairs. When restoring a BVI struck-off company the certificate can be seen as a proof of the completion of the restoration process. 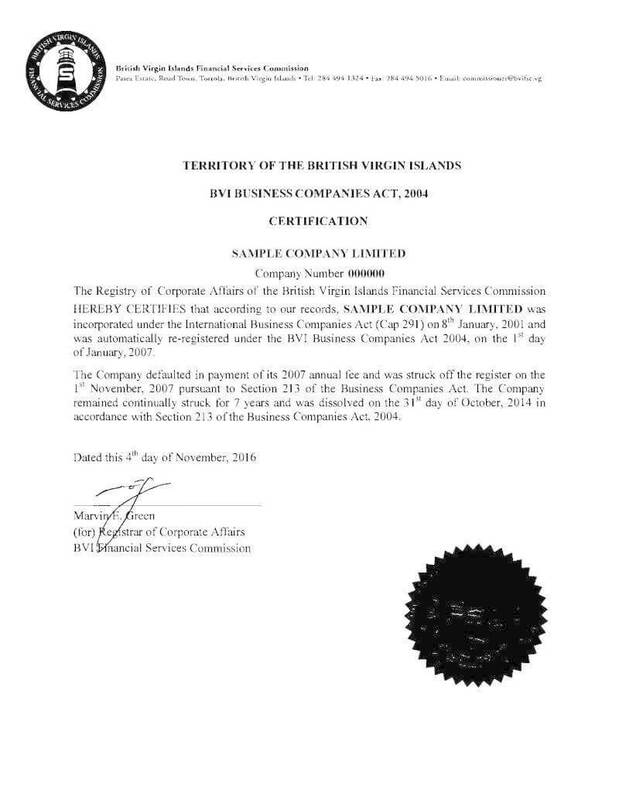 This is another common BVI Company Certificate. It certifies that the company was incorporated in the British Virgin Islands according to the applicable legislation (depending on when the company was incorporated). This document confirms that the company satisfied all the requirements for incorporation under the applicable Companies Act and it was duly incorporated in the BVI Registry of Corporate Affairs. 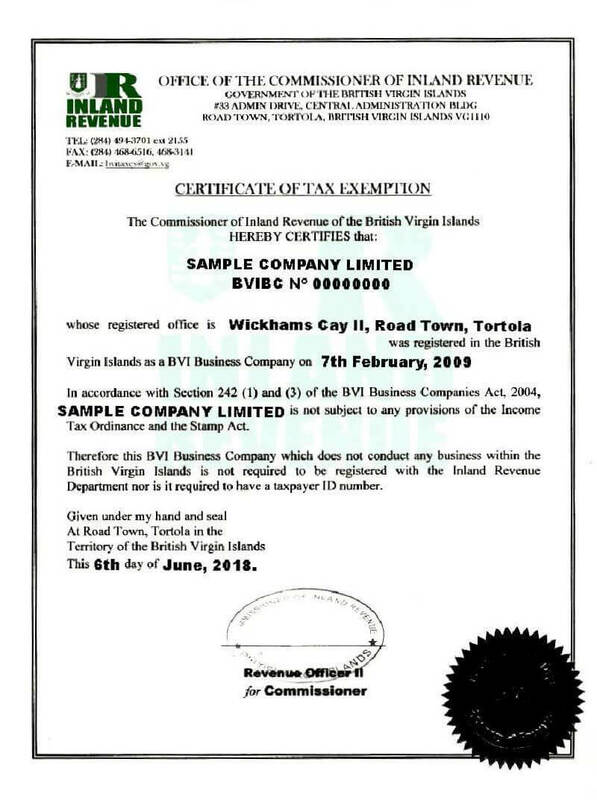 BVI Companies are exempt from income taxes and a certificate showing this fact can be requested to BVI Inland Revenue. This certificate is valid for 12 months. Any document filed by a BVI Company to the BVI Registry of Corporate Affairs can be certified, notarized and apostilled. In addition, any situation concerning a BVI company can be certified by the Registrar of Corporate Affairs. This is very useful because some situations such as redomiciliations, mergers or re-registrations can't be certified by a single document but with several documents unlinked among them. 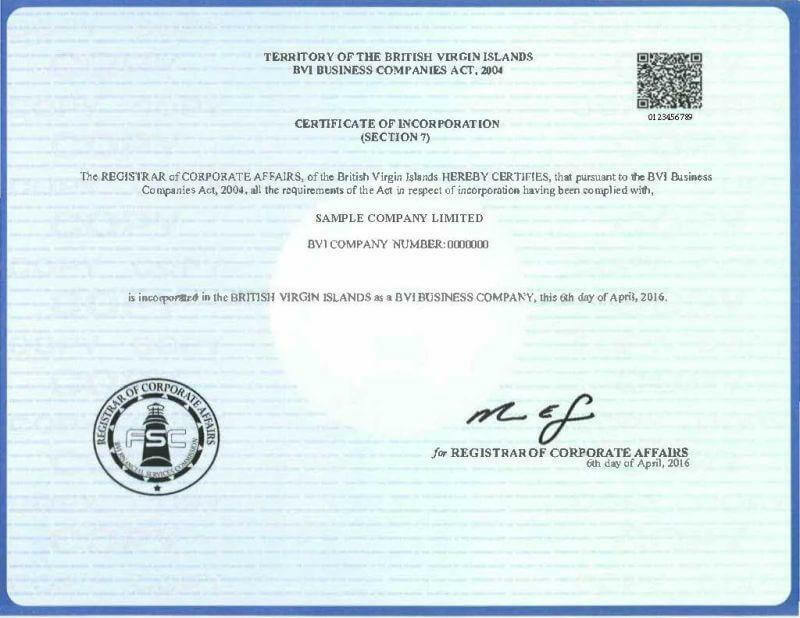 We deliver BVI Company Certificates within 2 business days in their electronic form. Printed certificate delivery can take up to one week depending on the delivery address. If the Certificate is Notarized and Apostilled these delivery times are increased by one business day.